MPS announces the introduction of the MP5461, a dual input, 4-switch, integrated buck-boost converter. It is capable of regulating the output voltage from 4.2V to 5.5V VIN1 and 2.5V to 5.5V VIN2. The VIN1 can withstand up to 22V input voltage but is not functional after >5.75V. 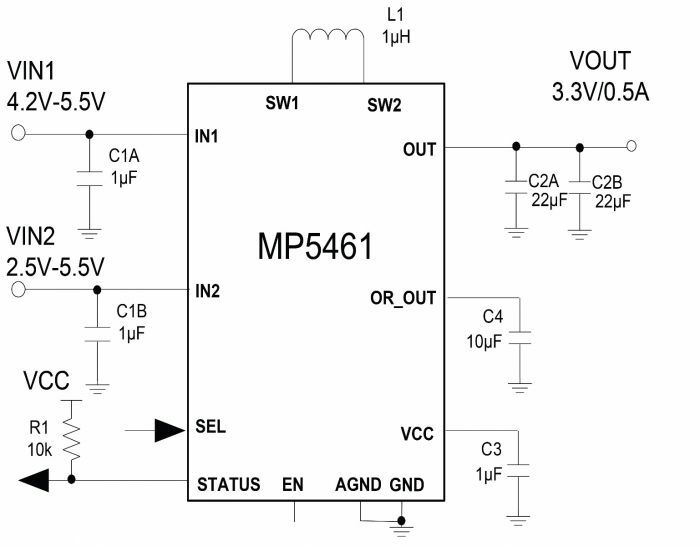 The MP5461 has two auto-ORing switches from VIN1 and VIN2 to achieve a stable input for the buck-boost converter. The two sets of ORing MOSFETs are integrated. If one channel power source falls, the fast turn-off protection minimizes the reverse current. The buck-boost converter can operate from an input voltage above, equal to, or below the output voltage. It uses current-mode control with 1.8MHz fixed PWM frequency to optimize stability and transient response. In a light-load condition, it enters PFM mode to get high light-load efficiency. Integrated MOSFETs minimize the solution size while maintaining high efficiency. Fault protection includes VIN1 OVP shutdown, output hiccup current limiting, and thermal shutdown. The MP5461 is available in a tiny CSP-12 (1.4mmx1.8mm) package.